This story gave me all sorts of warm fuzzies and left me smiling for the rest of the day. Several of my favourite genre tropes are here – there’s a brooding bad boy rock star, a dedicated, solitary paediatrician, and a wonderful bromance that becomes something more. When Hunter and Jesse first meet, they get drunk on a train together. The slightly geeky doctor and the wild child rocker aren’t an obvious match, but they work – and from the start, they make each other better. I loved the friendship that builds as Jesse becomes invested in Hunter’s patients. Both Hunter and Jesse are complicated men and I love the slow burn chemistry between them. I love the easy dialogue between these two and I also love the slightly awkward moments as they attempt to join their lives together. As much as I love the story, I’m not sure I fully believed the conflict in the book. Jesse is closeted professionally. In Canada. In 2017. Even one of Hunter’s young patients doesn’t get it – pointing out that gay marriage was legal in Ontario in 2004. The situation does add drama and tension – if not realism. But ultimately, this is a character and relationship driven story and I loved the characters and their relationships. Jenny Holiday is a new author to me and I really love her writing. I’m definitely going to be looking for more of her work. The second book in the series, I read it as a standalone. I shall, however, be reading Famous when I get the time because Ms. Holiday's writing style is much to my liking. This is a really well constructed story, which I have added already to my reread list. This is both because it is a super hot and cute story, but also because I know I read it at high speed, so much did I want everything to go the way I hoped. I found the set up – with their first meeting on the train at a seminal point in both their lives – to be a really gorgeous start to a really lovely story. Whilst we know why Jesse is super cautious, we also know just how he feels, so we can only hang on and hope that the issues he finds to be difficult to address will be resolved. Even though the reason may be trite, he gave his word, and following the 'brand' advice has brought them success. I also loved that this barrier means that they become truly good friends, and that is incredibly valuable at setting up the future that they both deserve. Some of the conversations with the bandmates, particularly early on, are very funny and seeing them away from the groupies and being decent guys is endearing in a 'bad boy' rock star novel. The hospital visits start out as a brilliant way of giving Jesse a chance to understand Hunter's world, and to make a difference without a fanfare. Ms. Holiday does not disappoint with the way the story develops, and I urge you to add it to your reading list. I shall be looking out for future installments with great interest. 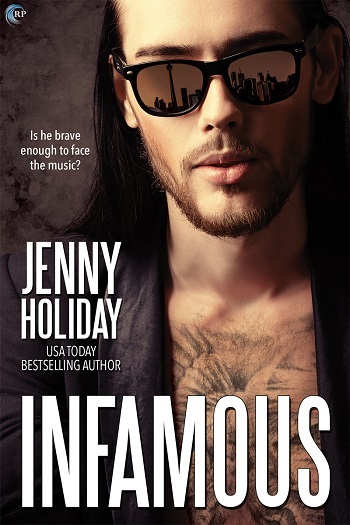 Reviewers on the Wicked Reads Review Team were provided a free copy of Infamous (Famous #2) by Jenny Holiday to read and review.